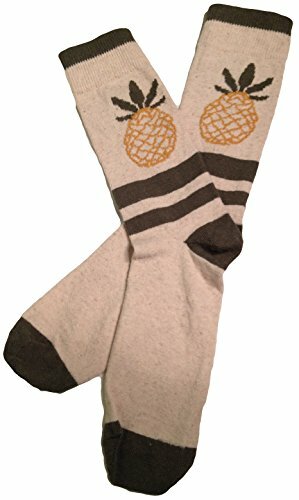 ADD COLOR TO YOUR ATTIRE WITH BUDDIES CRAZY PATTERN SOCKS FOR MEN- Change up your workwear with a pair of Buddies cool marijuana socks. You can pair your versatile patterned crew socks with your casual attire, or even add a bit of character to your formalwear. Match these crazy dress socks with your tie or don't. It's up to you. 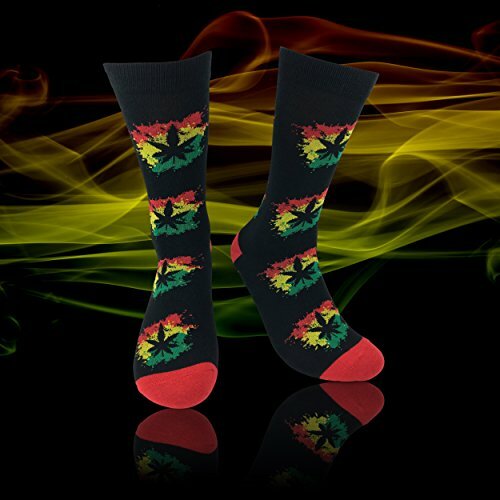 Our trendy men's socks come in Men's size 8-12 (U.S.)/40-45 (EU).,OUR FUNKY MENS CREW SOCKS OFFER ALL DAY COMFORT AND BREATHABILITY- Comfortable elastic & breathable cotton blend mens marijuana socks. We use a special recipe of 80% cotton, 17% nylon, and 3% spandex to craft our soft and stretchy mens cotton patterned socks so that they hold their elasticity and softness for long term use. 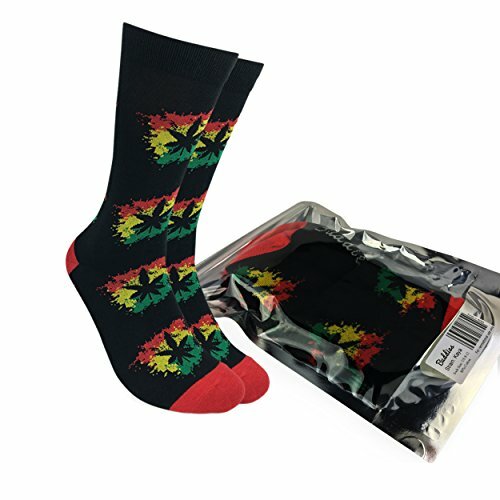 These ganja socks also have medium thickness so that your feet feel cushioned and comfy all day long.,BUDDIES MARIJUANA PRINT SOCKS ARE DESIGNED WITH FOOT HEALTH IN MIND- We have cleverly woven anti-bacterial properties into our range of colorful patterned socks for men. 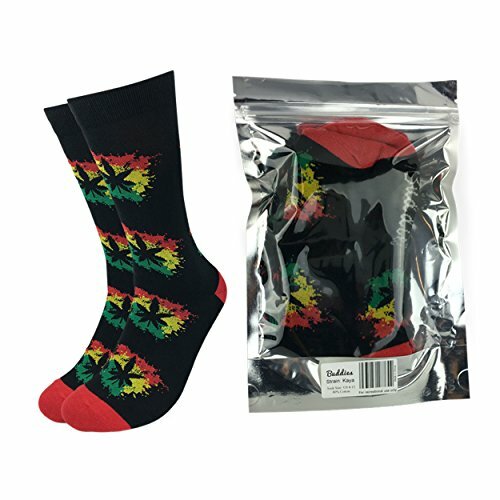 These printed jamaica weed socks are moisture wicking and breathable too. 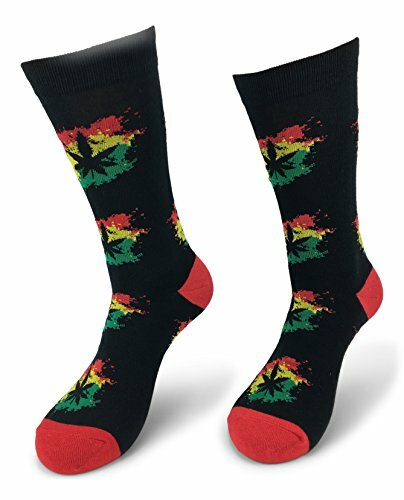 Quickly transfers moisture from your feet to the sock's outer layer, keeping your feet dry, comfortable, and smelling fresh all day.,FUN AND FRESH MARIJUANA LEAF SOCKS MAKE A CHEEKY GIFT FOR MANY OCCASIONS and 420 - These premium-quality rasta weed socks make ideal tongue-in-cheek bachelor party gifts or college graduation gift. These funky socks for men make for memorable wedding and event photos- Our marijuana dress socks add a nice splash of color and personality to groomsman and prom photos.